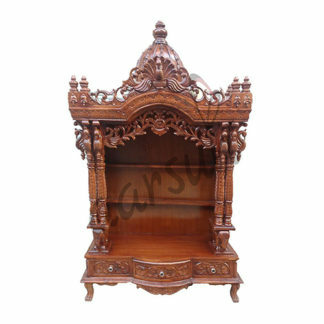 Product Size: 48″x20″x60″ (LxBxH) : In inches approx. The Top consists of Single Large Dome with carvings on the top and in front, a Mehraab with Peacock carved in front with a matching design at the sides as well. The center is the area where the idols are to be placed. It consists of 2 pillars on each side of the entrance. The piilars are designed with Elephant at the base and peacocks at the top. In front a mehraab is placed similar to the one at the top in front of Dome. The Back of the temple also consists of 2 shelves for small idols / photoframes. 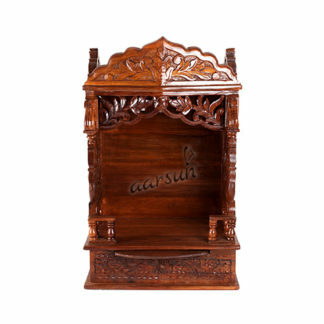 The sides consists of a Jaali pattern and the back portion has single pillar at each side. The base consists of a slider tray in the middle and three drawers with carvings on front and channels. The Drawers can be used as a utility for your pooja essentials. The whole Temple is supported by 4 legs at the base.